Can a detox cleanse your liver? This is the first article in our new ongoing series Science or Snake Oil. Articles will look at the claims for a product and decide whether they are supported by science or lacking in evidence. The human adult liver weighs about one-and-a-half kilograms, making it one of the largest organs in the body. It is responsible for a range of functions. It helps break down fats, carbohydrates and proteins into substances the body can utilise. The liver acts as a storage unit for these substances (including vitamins and minerals) and supplies the body with them when they need it. For example, when your blood sugar level drops, the liver will release stored carbohydrate (glycogen) to rectify the problem. It also acts by metabolising toxins into harmless substances or by eliminating toxic substances from the body. Clever marketing has led us to believe it is the food that contains toxins and, hence, following a diet that eliminates certain foods and taking over-the-counter products that “cleanse” your liver of “toxins” will detoxify the liver. Can the liver be ‘cleansed’? We have a misconception we can “cleanse” the body by following a “detox” diet. This is a complete fallacy. To explain this process one must first understand exactly what a toxin is. A toxin is a harmful substance that enters your body from the environment. Examples include carbon monoxide from motor vehicles, bisphenol A (BPA) from consumer plastics, and heavy metals such as lead and mercury. Toxins can also include drugs and poisons. However, substances are only toxic based on the quantities in which we ingest them. The situation in which “detoxification” is required is when someone is being treated in a hospital for a dangerous level of a substance that is life-threatening. The liver is otherwise working to eliminate unwanted substances in the body through our faeces and urine. These are the toxic byproducts from the metabolization of foods. For example, excessive amounts of protein can be dangerous to the liver. Many over-the-counter products claim to “clean” your liver of “toxins”. 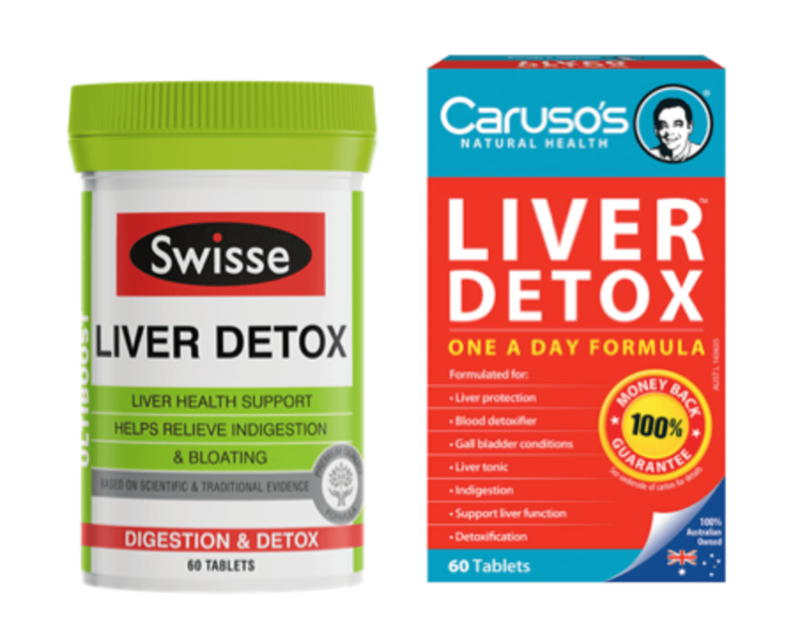 But does the liver really respond to an over-the-counter product that claims to “detoxify” or “heal” its function? Most of these products contain the active ingredients from Silybum marianum (known as milk thistle) and Taraxacum officinale (known as dandelion). Many of the formulations also contain other ingredients such as selenium, phosphatidylcholine, amino acids, artichoke leaf, green tea leaf and turmeric root, to name a few. Several companies produce a range of liver detox or liver cleanse products with varying quantities and ingredient compositions. But how strong is the evidence to show these active ingredients actually help with liver repair? 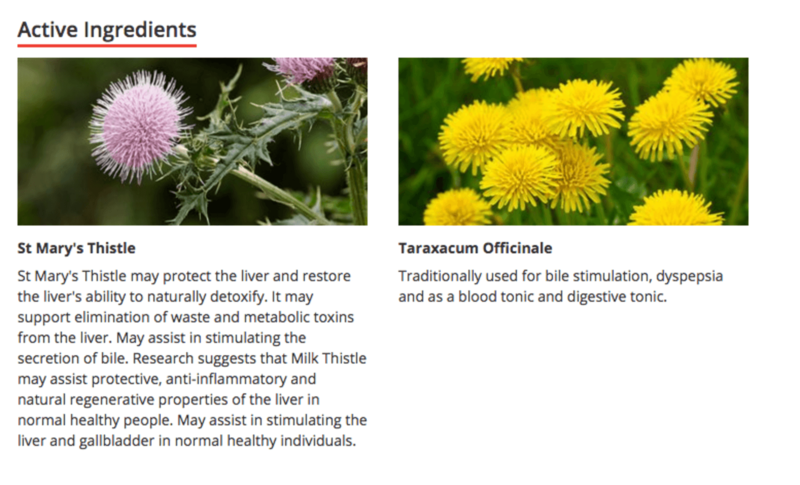 Milk thistle extract (standardised to 80% silymarin) is the most commonly marketed herb claimed to “detoxify” the liver. Silymarin is the active ingredient in milk thistle. The use of milk thistle for treatment of various diseases dates back to Dioscorides, the first-century Greek physician. In more recent times, it has been used to treat liver disease. However the majority of studies that have been conducted are of low-quality study design, so its purported efficacy is still questioned. There is some evidence to suggest milk thistle (usually accompanied by other substances) is beneficial for improving blood cholesterol, insulin resistance and inflammatory markers in the body. There is no evidence, however, to suggest milk thistle “detoxifies” the liver – which many of these products claim. Dandelion’s therapeutic use dates back to the tenth century for liver and spleen disorders. Since then, the medicinal use of the plant has been tested for a range of diseases. But the evidence is contradictory, or based on poor study design with incomparable results. Of greater relevance is that the majority of research investigating the efficacy of this flower extract has been tested only in animals. Similar to milk thistle extract, there is no evidence to suggest it helps to eliminate toxins or detoxify the liver, and hence serves no benefit for such a proposed indication. To have a well-functioning liver you simply have to eat healthy foods and limit your consumption of substances, such as alcohol, that cause it to work harder. Excessive consumption of any one particular food may contribute to an increased load on the liver. Therefore, a healthy, well-balanced diet based on national guidelines is the best liver “cleanse” available, rather than spending disposable income on over-the-counter products that are not backed by scientific literature supporting such claims. Complementary medicines are one of the largest growing markets in the world. Governing bodies must continue to incentivise companies to conduct innovative research to support the specific claims accompanying their products. It’s imperative companies are transparent in their advertising claims so consumers know what they are spending their money on from both an efficacy and safety point of view. Evidence for approved ingredients should not be generalised from product to product. This is because the evidence supporting one such product is made up of a unique combination of ingredients and dosages. The most recent review of the regulatory framework for complementary medicines is available on the Department of Health website.